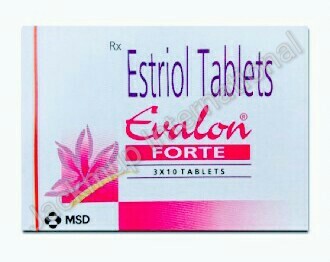 Description:- Evalon forte 2 mg tablet is used for post menopausal osteoporosis and hormone replacement therapy (hrt).It belongs to a class of drugs called estrogens. As a part of the hormone replacement therapy, it works by maintaining the estrogen levels in the body in menopausal women. It also reduces the vaginal wall from becoming thin and dry thereby reducing inflammation. Inform your doctor if you have had or have growth of the womb lining such as uterine fibroids or endometriosis, risk of estrogen dependent tumors (family history of breast cancer), increased blood pressure, heart or kidney dysfunction, diabetes mellitus, gallbladder stones (cholelithiasis), severe headache, fits (epilepsy), asthma, otosclerosis (abnormal formation of middle ear bone leading to deafness), increased levels of triglycerides, asthma or increased risk of blood clots. Ensure that you undergo regular breast screening (for presence of lumps or any abnormal changes) and cervical smear test while taking estriol. Do not take if allergic to estriol or any of its ingredients. Do not take if chest pain (angina) or a heart attack (myocardial infarction), blood clot (thrombosis), breast cancer or suspected to have breast cancer, cancer of the womb lining or ovaries. Do not take in unexplained vaginal bleeding. Patients with the history of liver diseases or impaired liver function. Patients with excessive thickening of the womb lining (endometrial hyperplasia). People who have serious hereditary disorder related to haemoglobin (porphyria).